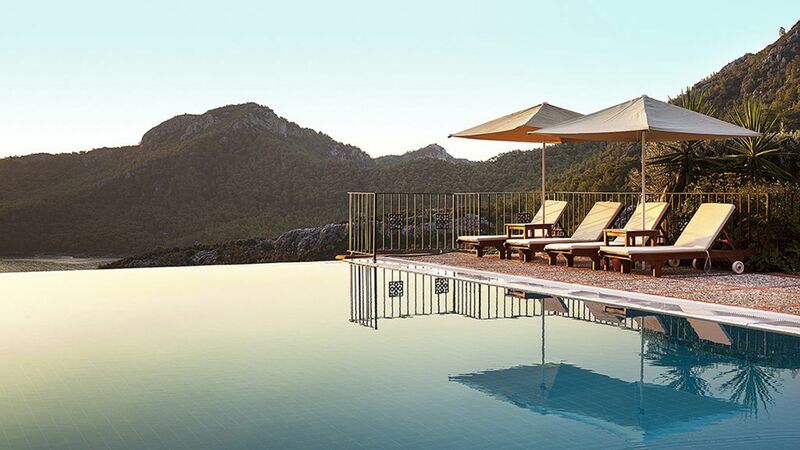 Dionysos Hotel sits on a clifftop overlooking peaceful Kumlubuk Bay on Turkey’s Bozburun Peninsula. Lively Marmaris lies just 25 kilometres from the hotel. Designed in the style of a classic Dalaman village, the hotel’s Mediterranean suites feature private terraces with views of the turquoise sea. Guests have access to a free seven-minute shuttlebus to the hotel’s private beach, which boasts white sands, loungers and the Kumlubuk Yacht Club. Cool off in the hotel’s freshwater pool, which has panoramic views of the bay, or take advantage of the onsite spa, gym and tennis court. Other activities include kayaking and yoga, as well as a putting green and driving net for golfers. Dine with sea views at Dionysos Terrace, which has a Mediterranean menu. The hotel hosts a weekly Taste of Turkey dinner, showcasing traditional food paired with local wines, as well as olive and wine tasting sessions. You can also join trips to nearby UNESCO World Heritage Sites and moonlight cruises. Dionysos Hotel is adult-only, except on select dates between June and August. The hotel has 43 suites and villas. This al fresco restaurant serves up a taste of the Mediterranean, offering a fusion menu with ocean views. Dishes are made from homegrown organic produce. Dionysos Terrace also hosts a buffet dinner with live music every Tuesday. The poolside bar at Dionysos Hotel features sweeping views of the bay and sea beyond. This is the perfect place to sip on a sunset cocktail or cool down with an afternoon drink. This restaurant seats a maximum of 16 people for an exclusive dining experience once a week. The Tastes of Turkey degustation menu features traditional and modern Turkish cuisine paired with signature wines. Reservations are recommended for Nar. 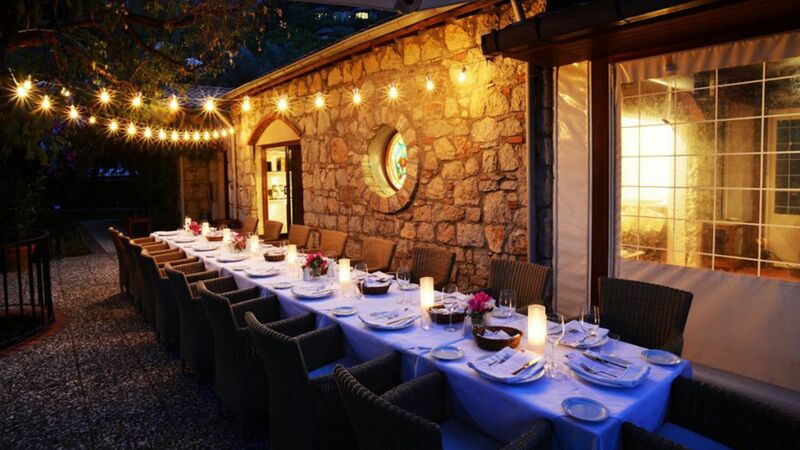 Dionysos Hotel hosts a weekly dinner at its farm. Feast on mezzes and stone oven roasted lamb around a candlelit farmhouse table for an intimate dining experience. Set on a clifftop, the hotel’s freshwater pool looks out over the surrounding mountains and bay below. The pool has plenty of loungers, parasols and a bar for the ultimate relaxation session. Guests have access to a private beach and complimentary shuttlebus service, which takes just seven minutes to reach the bay. 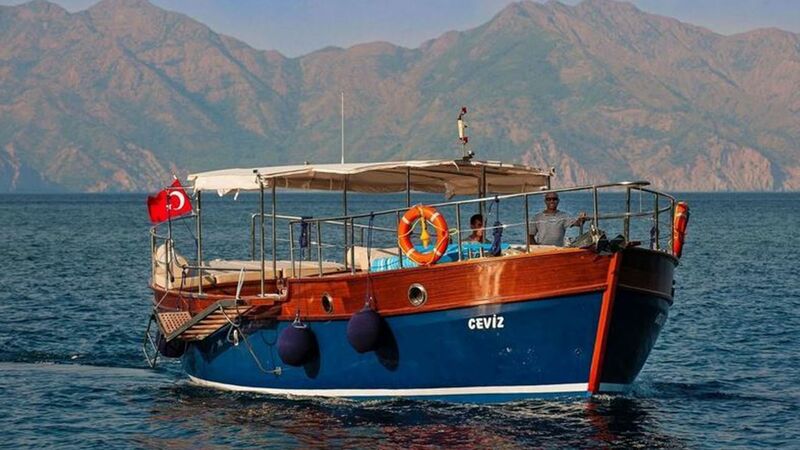 Lie back on loungers by the crystal water, or visit the Kumlubuk Yacht Club. If you’re feeling more active head for the gym, which has the latest equipment and exercise machines. 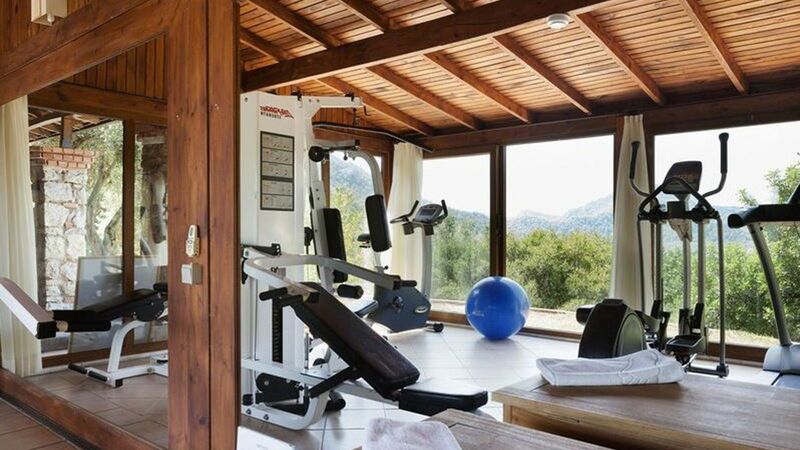 You can work out while enjoying sea views from the large windows. Indulge in a pampering session at the Dionysos spa, which offers a range of therapies and treatments. Choose from facials and massages, relax with a manicure or try some reflexology. Trained staff will provide a consultation and tailor each treatment to your needs. Learn the art of Hatha Yoga, a stretch-based class with a gentle and slow pace where guests can understand and perform meditation and proven relaxation techniques. 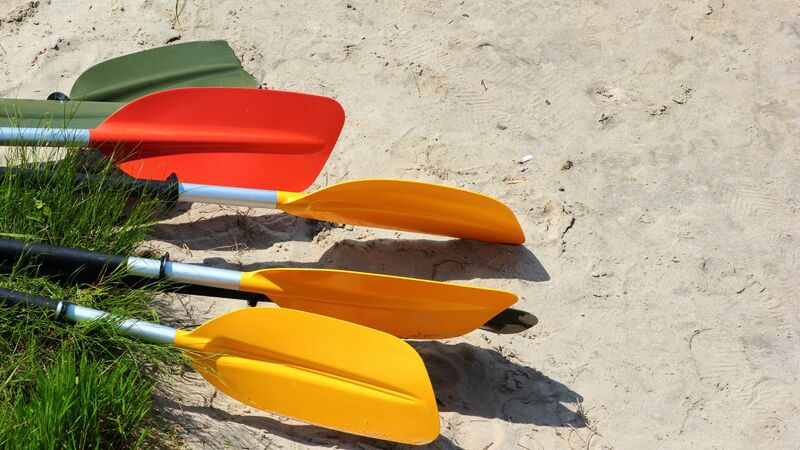 Take a classically restored life boat out into the bay to explore the jagged coastline and its peaceful, hidden beaches. Visit the UNESCO World-Heritage Sites of Stratonikeia & Muğla Old Town. With a rich history of gladiators, archaic Ottoman buildings and numerous ancient sites to see. Following that, you'll be whisked down to Akyaka, a beautiful beach resort at the end of the Gulf of Gokova before a 25 minute river boat trip back to the hotel (weather permitting, of course). This tour operates on a Wednesday. Set off on a two person kayak from Turunc to Kumlubuk via Baklabuku for a half day trip around these idyllic little bays with their crystal clear waters and pebble beaches. 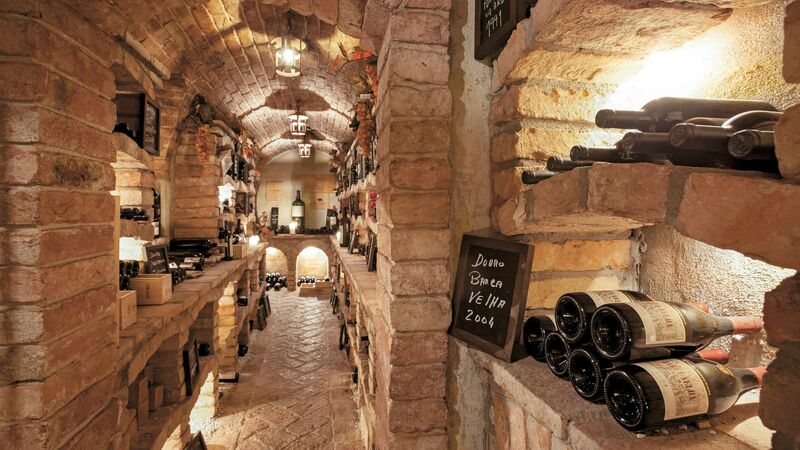 Join some real connoisseurs in the wine cellar for an enjoyable early evening sampling wines from across the Turkish regions, before deciding on your favourite, which will be served to you that evening at dinner. Head out of Kumlubuk Bay and off into the sunset with a glass of champagne in hand as you admire the sun setting over the Aegean Sea. Once it's dark you'll stop at the idyllic Kadirga Bay for a moonlit swim and candlelit dinner. 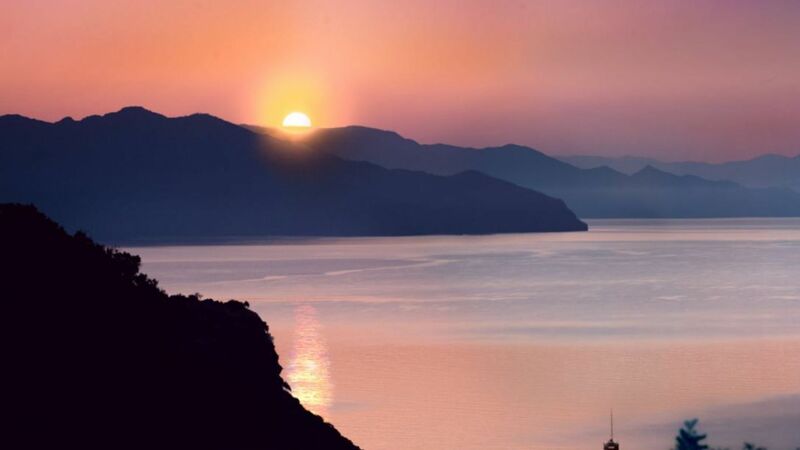 Dionysos Hotel can be found nestled on a hilltop, overlooking the spectacular Kumlubuk Bay. Just minutes away you’ll find the town of Kumlubuk, where you can spend long lazy days relaxing on golden sands or hike in the emerald hills which surround the area. The hotel also has its own private beach, which is just a seven minute drive away. This area of Turkey, the Turquoise Coast, is well known for its fresh fish, with restaurants peppered along the coast and offering a chance to immerse yourself in Turkey’s relaxed and friendly culture. Visit Marmaris for some history and culture, or head into the hills and explore the Greek theatre. 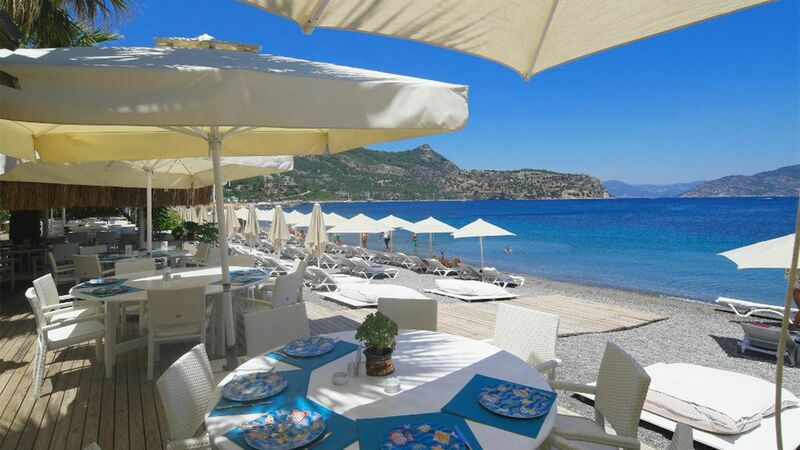 Dionysos Hotel is a two hour and five minute drive from Dalaman Airport. Junior Suites are sleek whitewashed rooms with large double beds, chic contemporary furniture and a cute but spacious terrace offering simply stunning views out to sea. With their little directors style chairs, a log table and authentic rock surface then they are perfect for relaxing outside with a glass of wine during sunset. There is a large bathroom with two sinks, a wardrobe and various modern amenities included. Deluxe Suites are spacious and boast a classic eastern Mediterranean feel with a minimalist design complemented by various pieces of Turkish pottery and exotic art pieces. A fully equipped kitchenette is featured as well as a lounge area with chic contemporary furniture including a sofa, armchair and coffee table. Outside, Deluxe Suites boast an expansive terrace with a dining table, directors chairs and truly stunning views out to sea. Private Pool Villas are enormous with two bedrooms and boast a classic eastern Mediterranean feel with a minimalist design complemented by various pieces of Turkish pottery and exotic art pieces. There's also a fully equipped kitchen with a dining space, modern amenities and plenty of storage. The spacious lounge area comes with chic contemporary furniture including a sofa, armchairs and a coffee table. Outside, a private pool with loungers and straw parasols is the centrepiece of the expansive terrace. Guests staying for a minimum of 7 nights receive one free dinner per person per stay on a Tuesday (excludes beverages) for holidays between 06 May - 14 October 2019. Guests staying for a minimum of 7 nights receive one complimentary remedial or relaxing back massage per person per stay for holidays between 06 May - 14 October 2019. Guests receive a welcome gift on arrival when staying for a minimum of 7 nights for holidays between 06 May- 14 October 2019. Fantastic reception and food for my wife's birthday. We will return and probably stay a night or to before and after we visit HPB at Physkos. The table was presented for a special occasion and the food was exquisite evening. The birthday cake was a great final touch. What a gem! I spent two nights here with a group of colleagues and friends and it is impossible to fault any aspect of this hotel. A shining example of how hospitality should be. A beautiful pool, an incredible view, great people, super villas and wonderful service. Went to Dionysos for the 5th time this year. A haven of peace where everything is done to provide a hard to beat holiday? 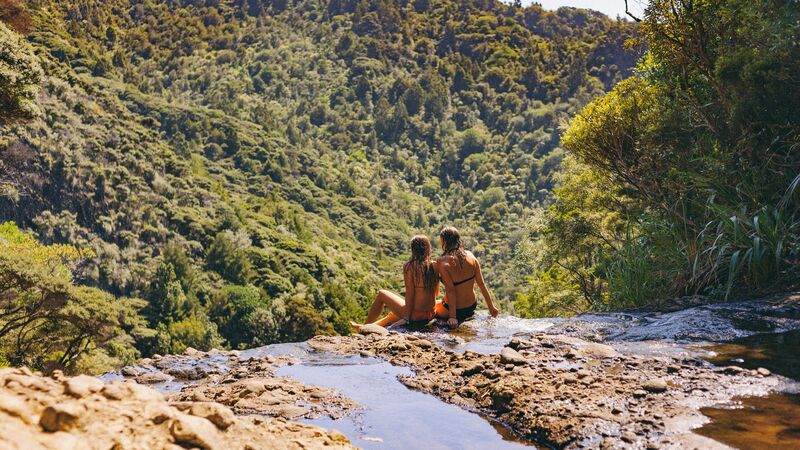 June is the perfect time to visit. Do join the lovers of this unique place. But, if steps are difficult, try and get a room on the first level. The Dionysos is a group of 43 villas built on a hillside overlooking the sea and set among lush gardens. The layout and design of the various buildings is very well thought through and there are many relaxing activities on and off site. The admin staff are very helpful and willing and made us feel very welcome. The food is excellent, the senior waiters fun, engaging and very helpful and with complimentary bus shuttles to the yacht club and nearby towns, the whole experience is fabulous. The peninsular is beautiful and well worth exploring. we have immediately booked again for 2019 and will be bringing friends. 10 out of 10! 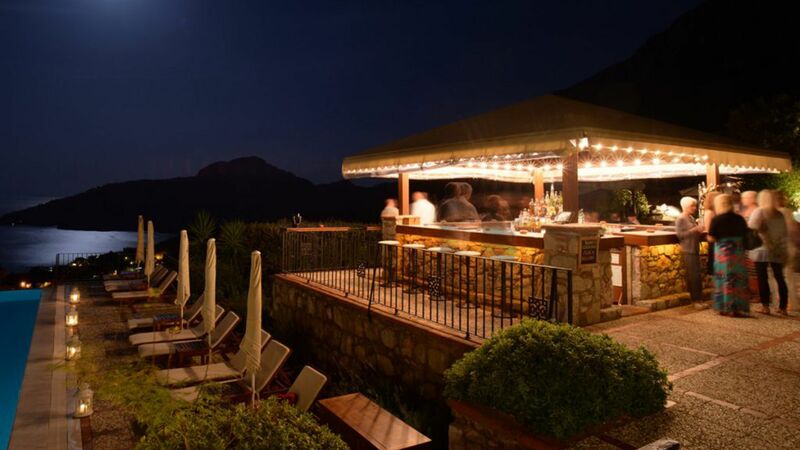 The Dionysos Hotel has possibly one of the most superb locations of any in the region. Perched high up a steep lane above the bay of Kumlubuk & its Yacht Club. Truly magnificent views...a remarkable horizon pool and numerous private cottages dotted around the hillside. The owner and his wife are wonderful hosts and remarkable entrepreneurs. We didn't stay but ate at their Organic Farm higher up the hill and came down to Dionysos for drinks at the end of the evening. I would definitely recommend this place and would definitely like to stay here.